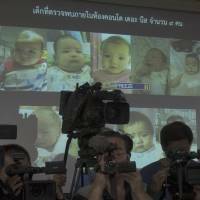 BANGKOK - Interpol said it has launched a multinational investigation into what Thailand has dubbed the “Baby Factory” case: a 24-year-old Japanese businessman who has 16 surrogate babies and an alleged desire to father hundreds more. 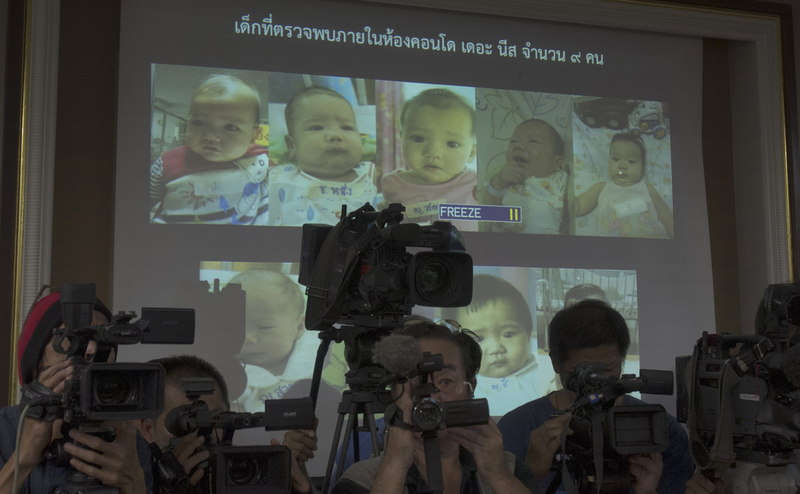 Police raided a Bangkok condominium earlier this month and found nine babies and nine nannies living in a few unfurnished rooms filled with baby bottles, bouncy chairs, play pens and diapers. They have since identified Mitsutoki Shigeta as the father of those babies — and seven others. Apichart said that regional Interpol offices in Japan, Cambodia, Hong Kong and India have been asked to probe Shigeta’s background, beginning last week. Police say he appears to have registered businesses or apartments in those countries and has frequently traveled there. “We are looking into two motives. One is human trafficking and the other is exploitation of children,” said Lt. Gen. Kokiat Wongvorachart, Thailand’s lead investigator in the case. He said Shigeta had made 41 trips to Thailand since 2010. On many occasions he traveled to nearby Cambodia, where he brought four of his babies. As for Shigeta’s motives, Kukunashvili said he told the clinic’s manager that “he wanted to win elections and could use his big family for voting,” and that “the best thing I can do for the world is to leave many children.” Kukunashvili declined The Associated Press’ request to talk to the clinic manager. Kukunashvili, who is based at the company’s headquarters in the country of Georgia, said she never met Shigeta but received reports from her Thai staff. She said that in April 2013, she sent faxes in English and French to Interpol’s head office in Lyon, France, and an email through the agency’s website, but they went unanswered. Apichart of Interpol in Thailand said the local office never saw the warnings. An Interpol spokesman in Lyon did not immediately return a call seeking comment. Kukunashvili also sent Shigeta an email to express suspicion, and attorney Ratpratan Tulatorn responded on his behalf in an Aug. 31, 2013, email that the clinic owner provided to the AP. The attorney said Shigeta was involved in “no dishonesty, no illegal activities.” He said his client hoped to keep using New Life, but the company then stopped working with him. Shigeta’s activities drew no attention until early this month, when an Australian couple was accused of abandoning a baby with his Thai surrogate mother — but taking his twin sister — after learning the boy had Down syndrome. Though the couple disputes the allegation, the case prompted a crackdown by Thai authorities on what had been a largely unregulated industry. After the Australian case emerged, police received a tip that prompted the raid on Shigeta’s Bangkok apartment. Ratpratan, the lawyer, appeared during the raid to insist that Shigeta had done nothing wrong. Ratpratan is no longer Shigeta’s lawyer, and his replacement has not responded to requests for comment. Shigeta’s current whereabouts are unknown.